Hédène's wooden honey dipper, made in France, is perfect to savor our French monofloral honeys simply and at any time. Thanks to it, no more flowing honey everywhere. Made from genuine Buxus and 100% natural, the Hédène's wooden honey dipper is the best utensil to savor French Hédène honeys to the last drop. Its grooved saddle is especially made to hold the honey to the last drop and makes you enjoy it to the fullest. Thanks to its simple and easy use, it can accompany each one of your greedy moments. 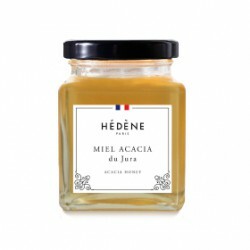 To use it, it is very simple: put the grooved saddle of the wooden honey dipper into the Hédène's nectar and turn it thanks to the handle not to lose a drop. Pull out the spoon and savor the honey.